It isn't a day of fashion news without news of a boycott. This one, however, is rather interesting and unexpected. 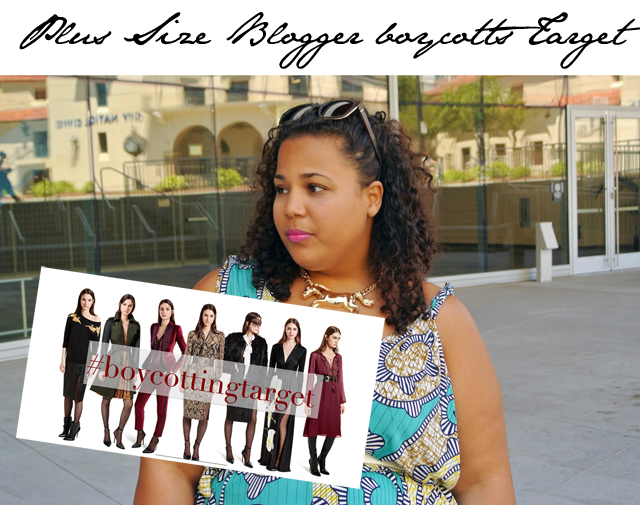 Plus size blogger, Garner Style, is calling for a boycott of Target. Seems she's none too pleased with the latest designer offering. Don't get her wrong, she's pleased as punch about the beautiful collection itself from Altuzzara, but she's kicking up a sh*tstorm over the fact that the collection does not come in plus sizes. So, she took to her blog to express her disappointment. "This may seem a little dramatic, but the recent release of the photos of Altuzarra for Target collection has me feeling slighted. I’m up late, working as usual, and I see Refinery 29 post 50 photos of the newest designer collaboration. Literally 50 pieces of beautiful (and I mean beautiful) affordable clothing and none of it will be remotely close to the size that I wear. The collection consists of deeps hues of burgundy, fabulous snakeskin prints, and fall worthy silk-like maxi dresses…enough to make any fashion lover lust. My heart sinks. You have once again made me feel like a second-class customer and because of that I’m going to have to discontinue my relationship with you altogether. Year after year, season after season, you put out these gorgeous designer collections and you almost never include a plus range. Every time each of these collections is about to be released it feels like a slap in the face. To add insult to injury, over 6 months ago, you took most of your plus size clothing out of the store, promising me something new and improved and that has yet to happen. I’ve been in this abusive relationship with you for far too long. I can’t do this anymore. I will be personally boycotting Target altogether. No more housewares, grocery shopping, electronics...nothing. I’m done. " To be quite honest, I've never been sure why Target didn't tap into larger sizes for nearly everything. If you look at the average size in the USA for women today, we're talking about a plus-size woman. Target is marketed as the store for everything for everyone, so what's the big deal in increasing your size load a bit? All of this is easy to say, but I do have a feeling Target have done their research. They must have found that plus size clothing, which has recently been moved online, is not a strong pull for them in stores. My advice? Instead of boycotting Target - shop them! Showing them that your size is in demand will show them there's an audience there to make money. That all being said, we'll see if Garner Style's boycott acts as a conversation starter for the brand.